Review of Kinect Sports – How close to a real sports workout do you get? Overall, Kinect Sports is a real winner. I’d say that it (and Dance Central, which I’ll review shortly) are the two “must have” games among the crop that launched with the Kinect. Even though it wasn’t designed as an exercise game, that it’s so fun that you’ll play it over and over again will almost guarantee that you’ll get more workouts out of it than boring repetitious workout games. As I mentioned earlier, when I first tried the Kinect, I was underwhelmed by the two titles I tried: Kinect Adventures and Game Party: In Motion. 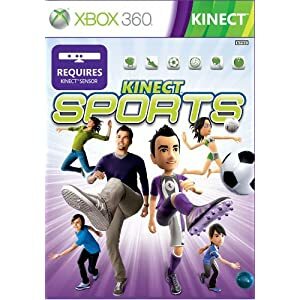 If Microsoft wanted to knock the socks off new users of Kinect, it should have taken a cue from Nintendo and bundled the excellent Kinect Sports with the Kinect. Kinect Sports not only spectacularly shows off the capabilities of the Kinect, it’s a great way to get exercise as well. It’s not a “pure exercise title”, meaning that it was designed first and foremost for “fun” and not for fitness. But that said, some (not all) of the games on the disc provide just as good a workout as any other fitness video game, and in same cases you get cardio benefits that almost rival the real thing. There are six different sports you can play. I’ve listed them out here, along with my take on how good a workout it provides. 1. Track & Field (fun: 5 of 5, workout value: 5 of 5) – Track & Field consists of several activities. “Sprint” has you running in place as fast as you can, lifting your knees. When competing against a friend, it can be a pretty intense workout, as both of you flail your arms and legs for a good 30 seconds. In “Javelin Throw” you reach out to grab an imaginary javelin, run in place until the “throw zone” and then hurl the javelin by making a throwing motion with your arm. The motion is much like throwing a real javelin (or what I imagine it to be anyway), in that if you don’t throw straight, your javelin may veer off course. You have three attempts to get the best score. In “Long Jump“, you have to run in place, lifting your knees as high as possible. When you get to the green jump zone, you need to jump in place. Run past the zone and you’re disqualified. Again, you have three attempts to get the best score. In “Discus“, you grab an imaginary discus. To throw it, you simulate throwing a real discus, by swinging back and making a circular motion with your arms. As with the real thing, the angle, speed, and position by which you throw makes a difference. Again, you have three attempts to get the longest distance. The final event is “Hurdles“. This one is a lot like “Sprint”, except when you get to a hurdle you have to jump with both feet off the ground. Another great workout.All in all, I was a bit surprised at how intense this workout was. Granted, each of the events are short, but they are very intense. String a whole bunch of these workouts together, and as long as you sustain an increased heart rate for 20-30 minutes, you’ll have get some great cardio out of it. Playing against the computer is fun, but playing against someone else can get really intense! 2. Boxing (fun: 5 of 5, workout value: 5 of 5) – There will be obvious comparisons to Wii Sports Boxing on the Wii and The Fight: Lights Out on the PS3. I’m going to say that, a few annoyances aside, Kinect Sports boxing outclasses both of them in terms of realism. Kinect Sports Boxing is a bit more difficult to “master” by getting into a pattern as in Wii Sports Boxing. The Fight: Lights Out has much more realistic graphics and much more precise mechanics than Kinect Sports does, but there’s something about holding two glowing sticks that sort of takes the realism away. What I like about Kinect Sports Boxing is that you have a full range of motions: left and right jabs, hooks, and uppercuts. The first nine levels are pretty easy to beat by just flailing your arms as with the Wii, but starting at around level 10 you need to be able to block punches (basically by holding your fists in front of your face to block high punches and uppercuts, and in front of your stomach to block low punches). As you block three punches in a row, three white “boxing glove” icons will fill up. Punching your opponent cleanly with all three icons filled will “stun” him, allowing you to pile on. The game is a little aggravating at times, in that it doesn’t seem to have a very good sense of depth perception (lunging at an opponent as hard as I can often ends up in a feather-light punch or a whiff) and the response is maddeningly sluggish at times. Still, in many ways these flaws help you work out harder as you try over and over again to beat each level against the computer. Fighting against someone is a bit more fun, as both of you are on an equal playing level (assuming one of you hasn’t been practicing!). 3.Beach Volleyball (fun: 5 of 5, workout value: 5 of 5) – Playing volleyball on the Kinect won’t improve your real volleyball game, but it’s still a nice and surprisingly accurate simulation of the game. You can play against the computer yourself, or if you play with someone else you can either be on the same team or on opposite teams. You wouldn’t think the game has the same kind of cardio as Track & Field or Boxing, but in all honesty on the more advanced levels you’ll find yourself doing a lot of jumping, running from side to side, and lunging. 4. Soccer (fun: 4 of 5, workout value: 3 of 5) – This is a passable (no pun intended) version of soccer for the Kinect. There’s really not much exercise involved–you just kick your foot to pass from player to player and then shoot. There is lunging involved when playing defense (you need to step in the path of the opponent’s balls) and in saving shots from goalies, but certainly not a sustained cardio working for a very long length of time. 5. Table Tennis (fun: 3 of 5, workout value:2 of 5) – Again, comparisons to the ping pong in Wii Sports Resort and the PS3’s Sports Champions will naturally come up. And I have to say that the Kinect’s version of Table Tennis lags behind both of them. The reason is simple: you don’t play ping pong by hitting the ball with your palm–you play it with a paddle. The PS3 Move version of table tennis is definitely the one to beat, and I’d say even the Wii’s version, with the Wii MotionPlus controls, feel much more realistic than this one. Microsoft should have made this handball or dodgeball or four square or some other game that doesn’t use a racquet. 6. Bowling (fun: 2 of 5, workout value: 1 of 5) – Here, I’ll let my 12, 9, and 7 year old nieces and nephew be the arbiters. Maybe it’s because they were used to Wii Sports bowling, but the Kinect just doesn’t do it in terms of fun. The real sport of bowling requires very precise wrist movement, but the Kinect can only detect movements in broad motions with your arm, so it’s not very realistic. As for workout value, hey, it’s bowling–and without the 10 pound weight. As I’ve mentioned a few times, one thing that really can get you motivated is playing with a friend. The sheer competition will have you challenging each other over and over again, and of course you’ll get some great exercise out of that. One amusing thing that happens after each game is that it’ll show videos of you in action. The videos, of course, are strategically designed to make you look as silly as possible (in the javelin throw, it looks like you’re doing some kind of bizarre tribal dance; in beach volleyball, it looked like I was doing MC Hammer’s “Just Touch This” parachute pants dance). One interesting phenomenon I noticed when I played with my nieces and nephew. After a brief period of excitement at first, they were not at all engaged in the game, while the adults were having a blast. I realized the reason–the Kinect is just too touch for kids. Even as an adult, some of the fine motor movements require getting used to. For a kid who’s used to just smashing buttons and flailing away, the Kinect and Kinect Sports in particular get frustrating real quick. One example: on Kinect Sports Boxing, if you just flail away at the opponent (as most kids will do), the opponent just builds up power and then wallops you. Worse, the opponent will effortlessly pack a huge punch immediately after blocking your punches, while if you manage to block punches it’s tough to get a punch in before you lose your power. It’s incredibly frustrating for grown-ups, and maddening for kids. So for kids, I think the Wii is still the clear choice. I’ve reviewed a lot of exercise games for the Wii, the Playstation, and now the Xbox. There’s one thing I’ve seen over and over again. Exercise games that are built first as exercise games follow the same pattern as the coat rack treadmill and the dust-covered exercise bike. You use them once or twice, and then never again. But the sign of a really great exercise game is one that, even if it doesn’t provide the most intense cardio workout, still gives you a bit of a cardio workout, but is so fun that you play it over and over again–games like Wii Sports, Just Dance, and Dance Dance Revolution fall into this category. I see Kinect Sports as the first great example of this for the Xbox, and I look forward to many more to come.